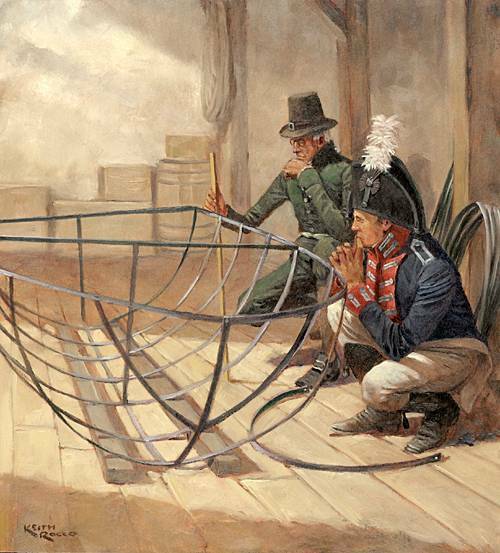 Joseph Perkins and Meriwether Lewis inspecting the iron boat frame. Courtesy Harpers Ferry National Historic Park. Because of the changes in technology over the last 200 years, it is easy to forget that Lewis & Clark’s Voyage of Discovery was the equivalent in its day of the Apollo missions of the 1960s. Meriwether Lewis had what amounted to a blank check to outfit the expedition, and he used it to acquire the best in men, weapons, and equipment. In March 1803, Lewis arrived at the federal armory in Harpers Ferry, Virginia (today’s West Virginia) and began working with superintendent Joseph Perkins on the guns, powder horns, bullet molds, tomahawks, knives, and other weapons the Expedition would need to make it across the continent. He also had a special project for the armory, one of his own invention. 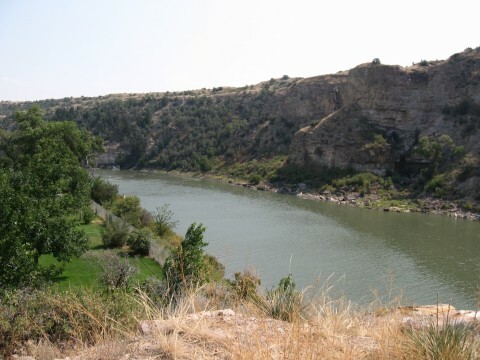 Lewis realized that if the Corps of Discovery succeeded in its mission of reaching the source of the Missouri River, that eventually the river would become too shallow for navigation by heavy wooden boats. His solution? A collapsible iron boat. According to Lewis’s design, the boat frame would be stored in sections, ready to be brought out at the opportune moment and covered in hides. With a seal of tar pitch or resin, it would be water-tight. But the first job was getting the thing fabricated. Lewis had originally planned on staying at Harpers Ferry for only a week, but he ended up spending over a month on what he called “my favorite boat.” On completion, the boat weighed just 176 pounds (a tiny fraction of the total 3500 pounds of gear the Expedition took), but would be capable of transporting over 8000 pounds of men and equipment if everything went according to plan. The iron boat rode quietly along in with the rest of the baggage until June of 1805, when Lewis’s big moment finally arrived — or so it seemed. The Expedition had discovered a series of enormous waterfalls in the vicinity of present-day Great Falls, Montana. The falls were beautiful, but they also meant that the Expedition would have to portage every single thing they had around them in order to get back on the river. Hauling everything 18 miles through rough unbroken country, under human power using makeshift wagons, was a month-long ordeal. And it was easy to see that past the falls, the river grew rocky and shallow. Lewis and Clark set up camps on either end of the portage. It largely fell to Clark to supervise the daily grind of the grueling portage. In the meantime, Lewis found hiding places to sink their heavy pirogues and began work on the iron boat. 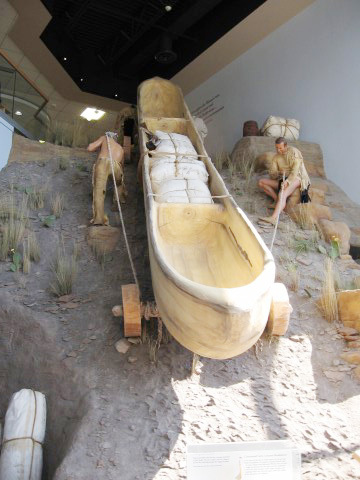 The hardships of the portage are vividly depicted in this exhibit at the Lewis & Clark Interpretive Center at Great Falls. You have to feel sorry for Lewis over what happened next. How could a frontiersman from the East have ever anticipated the wide-open plains of Montana? Beautiful, and without a pine tree in sight. Without a means to make resin, the project seemed doomed, but Lewis was determined to find a way. June 28: Set Drewyer to shaving the Elk skins, Fields to make the cross stays for the boat, Frazier and Whitehouse continue their operation with the skins, Shields and Gass finish the horizontal bars of the sections; after which I sent them in surch of willow bark, a sufficient supply of which they now obtained to bind the boat. expecting the party this evening I prepared a supper for them but they did not arrive. not having quite Elk skins enough I employed three buffaloe hides to cover one section. not being able to shave these skins I had them singed pretty closely with a blazeing torch; I think they will answer tolerable well. July 1 by evening the skins were all attatched to their sections and I returned them again to the water. all matters were now in readiness to commence the opperation of puting the parts of the boat together in the morning. the way strips are not yet ready but will be done in time as I have obtained the necessary timber. the difficulty in obtaining the necessary materials has retarded my operations in forming this boat extreemly tedious and troublesome; and as it was a novel peice of machinism to all who were employed my constant attention was necessary to every part of the work; this together with the duties of cheif cook has kept me pretty well employed. 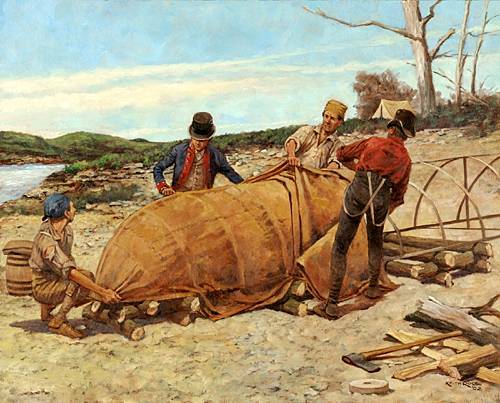 Joseph Field, Meriwether Lewis, Patrick Gass, and John Shields work on covering the boat frame with hides. Courtesy Harpers Ferry National Historic Park. July 3 – our tar-kiln which ought to have began to run this morning has yealded no tar as yet and I am much affraid will not yeald any, if so I fear the whole opperation of my boat will be useless. I fear I have committed another blunder also in sewing the skins with a nedle which has sharp edges these have cut the skin and as it drys I discover that the throng dose not fill the holes as I expected tho’ I made them sew with a large throng for that purpose. … The current of the river looks so gentle and inviting that the men all seem anxious to be moving upward as well as ourselves. we have got the boat prety well forward today and think we shall be able to complete her tomorrow … she has assumed her shape and looks extreemly well. She will be very light, more so than any vessel of her size that I ever saw. July 4 – no appearance of tar yet and I am now confident that we shall not be able to obtain any; a serious misfortune. I employed a number of hands on the boat today and by 4 P. M. in the evening completed her except the most difficult part of the work that of making her seams secure. July 5 – This morning I had the boat removed to an open situation, scaffold her off the ground, turned her keel to the sun and kindled fires under her to dry her more expediciously. I then set a couple of men to pounding of charcoal to form a composition with some beeswax which we have and buffaloe tallow now my only hope and resource for paying my boat; I sincerely hope it may answer yet I fear it will not. … the stitches begin to gape very much since she has began to dry; I am now convinced this would not have been the case had the skins been sewed with a sharp point only and the leather not cut by the edges of a sharp nedle. July 7 – The weather warm and cloudy therefore unfavourable for many operations; I keep small fires under the boat; the blowing flies are innumerable about it; the moisture retained by the bark prevents it from drying as fast as it otherwise would. Clark was quite terse about the boat construction in his journal, leading some historians to speculate that he may have been mad at Lewis for spending almost two weeks on his miracle project that was supposed to have taken only a few hours. But I find a world of sympathy in his final word on the matter, which memorializes the boat using Lewis’s own phrase: this falire of our favourate boat was a great disapointment to us. July 15 – At 10 A. M. we once more saw ourselves fairly under way much to my joy and I beleive that of every individual who compose the party. On the return trip on 1806, Lewis dug up the cache and found the boat had “not suffered materially.” The boat then disappears from history, its fate unknown.